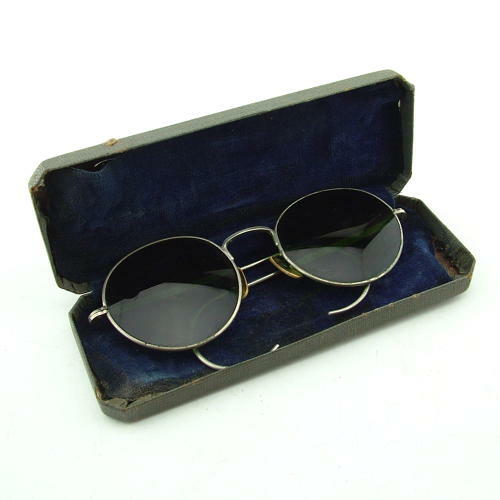 By British American Optical (BAO), stores reference 22c/961. Standard WW2 issue MK.VIII anti-glare spectacles/sunglasses with grey-green tinted lenses set within steel wire frames with side-arms featuring 'wrap-around' ear pieces. The frames are generally in very good condition bar light soiling, verdigris deposits and some vertical play in the hinges. The lenses are in very good condition. Air Ministry and reference numbers stamped into sidearm. The original hard case is in sound condition but is a little squashed and has markings for the slightly later issue MK.VIIIA spectacles. Wear and soiling to the velvet lining. Good used overall. Stock code G19970.